Choosing to buy a new house is one of the biggest decisions you can make, yet so many of us start looking for a new home while already sitting in a property with the potential to be perfect. Two of the top reasons for moving house are the need for more space, and a want to upgrade to a better property. And both can be sorted with a few alterations to your existing home. Read on to learn the best ways to improve your property, add value, save money and love where your live. Even when you decide to stay put, it is important to make changes to your home that will increase its value. The most basic changes like giving every room a fresh lick of paint or changing flooring will immediately make your home look and feel better for just a few hundred pounds. Feel like you don’t have enough space? Remember that reworking the layout of your home can make better use of the available rooms. It costs from as little as £1,200 to open up a kitchen-diner with a 1.8m gap in a load bearing wall, yet could add tens of thousands to the property value. Look for untapped space elsewhere too. A room-in-roof loft conversion (with skylights) could be used to add a bedroom. This can be done for approximately £20,000 – well below the amount it could add to your home. Before you reach for the builder’s hat though, don’t forget that something as simple as improving your storage situation can enhance how you live. Fitted storage that maximises every last inch is worth every penny. Buying a ‘better’ home is always going to cost you more money, but some people forget to factor all of the related fees into their calculations. Stamp duty is due on any property over £125,000. It is a tax paid by the buyer after completing on the purchase of the home. For properties between £125,000 and £250,000 this is rated at two per cent. For homes over £250,000 up to £925,000 this jumps up to five per cent. Once you add up the costs of fees, you might find you could be spending in excess of £20,000 just to move. Add this to the extra you might be borrowing to take out a mortgage on a larger property and it might make financial sense to improve rather than move. 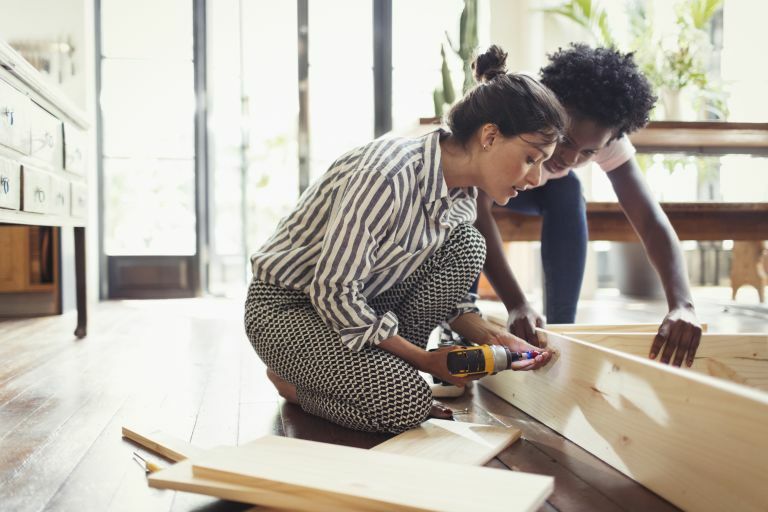 Borrowing to buy (AKA taking out a mortgage) is common knowledge, but you might be surprised to learn how much you could borrow in the form of a home improvement loan. Thinking of a quick bathroom upgrade? You could borrow £2,000 and make that happen. What about a garden room to turn into a home office? Work from home in style when you borrow £10,000. In fact, you could borrow up to £25,000 from the likes of HSBC to tackle your next home improvement project (credit is subject to status). Moving home is hard for many reasons. Having to get used to a new area might be on the cards. Perhaps the kids need to move schools. You might lose amenities you depend on. Worst case scenario, it could mean your local isn’t that local anymore and you have to negotiate the politics of being a newbie in another pub! On top of that the admin can be overwhelming as you have to remember to redirect your post, change addresses and move your utilities, TV package, Broadband and more, to a new property. Let’s not forget the physical and emotional stresses of moving day. It really does beg the question why anyone would ever move house unless they absolutely have to. It also confirms why so many people utter the words “never again” after a move. Remember when you first viewed where you live now, and think about all of the reasons you chose to buy it. We know life changes – families grow, requirements shift – but homes can be adapted. Be it the period features you couldn’t find anywhere else, or the garden you saw yourself retiring to in old age, the reason you fell in love with your home is probably still there. The trick is working out how to make it even better.